Twelve men, one room, and the life of another hanging in the balance. 12 Angry Men is a triumph of a film released 58 years ago. Such a simple premise, watching a jury deliberation regarding a murder case, yet its power is unwavering, its performances superb. 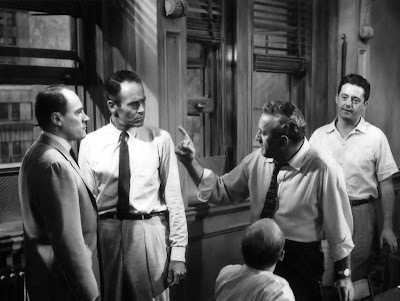 As the viewers of this Sidney Lumet masterpiece, we don't get to see any of the crime, as no flashbacks are shown to recreate what the men are discussing. We don't get to see any of the trial, because their words are plenty to provide us the details. What we get is a remarkably disciplined work that isn't really about the victim, the accused or the crime itself. 12 Angry Men is a character study about the different personalities inside that room, the prejudices they bring with them that can alter their perspective about the facts of a case, and the judicial system as a whole and the importance of reasonable doubt. These men are merely faces and voices to each other, and to some the most important thing is getting the decision over with because their plans are awaiting after they are released from their duty. I have always been fascinated by the real world stories of crime and their aftermath, the trial, the evidence, the jury and analyzing the verdict they eventually reach. I have heard of real life trials in which a jury member will admit later that the fact that they just wanted to go home played a role in swaying their decision, and I was always amazed and disgusted by this thought. I know, it's easy for me to judge as I am enjoying the comforts that are afforded with not being in their shoes, but I would like to think I would be able to take a step back and look at the big picture. This is justice for a life lost. This is how the accused will spend every single day of the rest of their life, whether they will be permanently labeled as guilty or innocent. This is potentially bringing a sense of closure to those who lost someone they loved, or possibly providing the opportunity to continue their search for who really destroyed their world so they can see the right person be punished. It is a flawed system, the jury system, because man is fallible and the wrong decision can be reached, but it is also an important one as well. 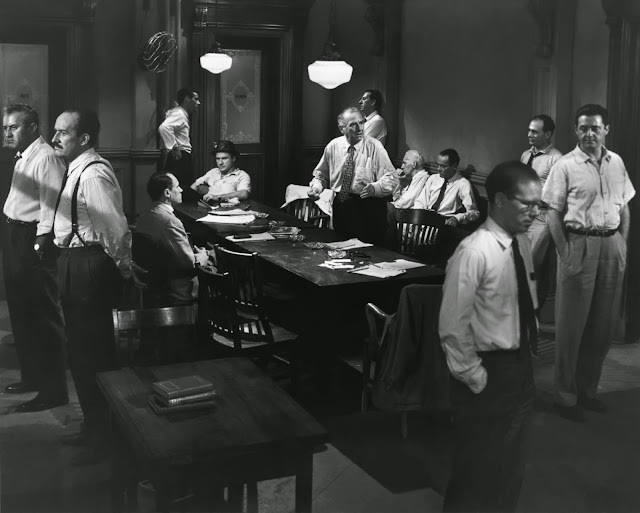 12 men sitting around a table, and 11 of them are ready to vote a man to his death so they can go home, get some fresh air, perhaps catch a ball game. Only one voice was willing to speak out and bring up some doubts, a voice that could have easily caved and conformed to those around him to make everyone happy, but with that vote a man dies. Can something of that magnitude really be so simple?